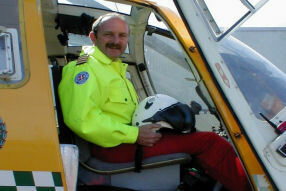 Squadron Leader Neil Airey cfs, RAF (Retd), served as an RAF Helicopter pilot for 20 years and is currently a HEMS Line Training Captain for Bond Air Services Ltd flying EC135 and Bolkow 105 Air Ambulances in the UK, mainly in the North West of England. Joined the RAF in September 78 after 8 years with Ulverston Air Training Corps (2223 Sqn). Air Cadet Gliding wings aged 17 and then Flying scholarship aged 19. 4 months Officer Cadet Training Unit at RAF Henlow, graduated as Acting Pilot Officer, then onto Jet Provost Mk 3a Initial Flying Training for one year at RAF Linton on Ouse on number 38 course. Selected through choice to go to Helicopters, started basic rotary course on Gazelles at RAF Shawbury, then onto Advanced rotary course on Wessex HU5 also at Shawbury. Gained wings October 1980, followed swiftly by a 2 month Wessex OCU at RAF Benson on the newly formed Wessex Training Flight. Posted to fly Wessex HC2 on 72 Sqn at RAF Odiham and served on that sqn for 3 years. Posted to 240 Puma OCU at RAF Odiham, then onto fly Puma HC1 with 33 Sqn at RAF Odiham for 3 years. Served all over mainland Europe as part of AMF(L) along with Belize, Central America. Back to RAF Shawbury for 4 month QHI trg on CFS(H). Graduated as a flying instructor and posted to teach basic rotary on Number 1(AFT) sqn RAF Shawbury for 4 years, then onto CFS(H) as staff instructor for just over a year. Loan service posting to Brunei for 3 and a half years flying for the Royal Brunei Air Force as OC Flying Standards instructing and examining on military Bell 212s, a Bell 214ST, Bell Jetranger 3s and Bolkow 105s. On TOUREX, returned to UK to fill in as Detachment Commander for UK AWACS force in Aviano, Northern Italy for 4 months, then posted to Defence Helicopter Flying Training School, RAF Shawbury flying Griffins on 60 sqn until retiring from the RAF in 1998. 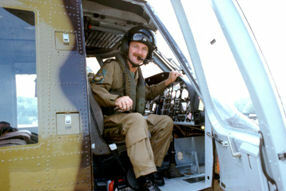 He currently has over 8500 flying hours of which over 900 are on ‘Huey’ types. 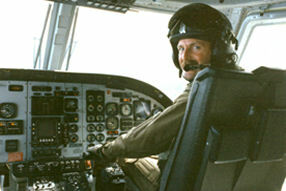 He is also the Chief Pilot of www.huey.co.uk and flies and displays both ‘Huey 509’ and ‘Loach 11’. My worst moment was in September 1987 when I was instructing on Number 1 (AFT) Squadron at RAF Shawbury flying Gazelle HT3, number ZB627. I was instructing 2 student pilots in mountain flying techniques in the Snowdonia Mountains of North Wales. The sortie was part of the final segment of the basic rotary course and both students were close to graduating onto the advanced rotary course. The plan was to fly both students in the same aircraft; one flying 'hands on' in the right hand seat and one observing from the rear. We would fly the first segment from RAF Shawbury into the mountains, carry out the training detail for the first student, then fly on to RAF Valley in Anglesey for refuel and lunch. After that, swap over students and then fly the same sortie profile but in reverse.The first part went as planned and lunch was good at RAF Valley. Whilst departing RAF Valley Military Air Traffic Zone (MATZ) along one of the helicopter exit corridors, flying at 500ft/ 120kts, 2 miles out from the airfield, we suddenly encountered 2 Herring Gulls immediately in front of the helicopter. My second student, 'McHoot' was 'hand on' at the time and he correctly and instinctively swerved aggressively left to avoid the 2 birds. Unfortunately there was a 3rd one which none of us had seen and it impacted the canopy right in front of my face. I recall the Herring Gull seemed to fill my side of the canopy as it came crashing through the Perspex. I was instantly hit in the face and chest by the severe windblast and fragments of shattered canopy. I felt the bird miss my head and pass by my right hand side between the student pilots head and my own! 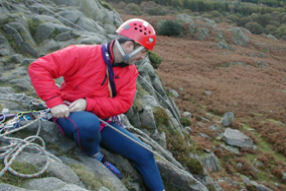 We all were wearing standard RAF flying equipment, namely a military spec flying helmet and a lifejacket/survival vest. The passing dead bird ripped out my helmet intercom connecting lead so I went electronically deaf and dumb almost instantaneously! I remember smelling and feeling blood on my face and an awareness that I was still in one piece with full motor functions. I looked across at 'McHoot' who was looking at me with very wide eyes! I then became aware that he was in the process of gently flaring the Gazelle thereby slowing down and starting a descent to land. I remember shouting over the intense wind noise ' I'm all right, now put this f*****thing down on the ground'. All of this happened in a matter of seconds. I quickly regained composure and survival instinct awareness that my student might not get the forced landing bit right and we might yet crash, so I shadowed him on the controls incase he lost it. He did however continued to fly superbly all the way down to the ground. Meanwhile as the speed reduced, the windblast noise reduced and I could start to think clearly again. The student pilot landed us safely and I told him to continue to shut it down. He had put out 3 MAYDAY calls during the decent, which I hadn't heard; an RAF SARTU Wessex flying nearby on an instrument flying training trip heard our 'Maydays' and quickly came to our assistance (thanks Ken and all!). Once the engine and rotors had stopped, all 3 of us climbed out of the Gazelle and made sure we three were all right. My students, 'Bunny' and ' McHoot' were fine, although shook up. It was obvious I was bleeding from my face so ' McHoot' raided the cockpit first aid pack and bandaged a lengthy but minor cut above my left eye. Needless to say we were all shuck up but very relieved to be alive and well, AND on the ground. We all walked around the Gazelle and looked at the damage. I had a camera with me so the pictures accompanying this are from that day's event. 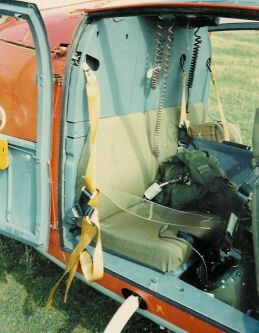 The impact shattered the entire upper left and centre of the left hand side canopy blowing it all inside the c aircraft. The windblast blew open both small rear side access doors, which smashed all the way open in the airflow but did not detach from their hinges. It f they had, then I'm sure they would have taken off the tail stabilisers and the tail rotor with fatal consequences. Lady Luck was on our side in this instance. 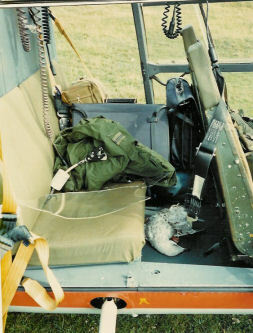 Most of the Perspex debris got sucked out of the cockpit in the windblast. The SARTU Wessex landed close by and all 3 of us walked over, jumped into the cabin and were flown directly into the RAF Valley medical centre for assessment. A flight time of only 2 minutes from take off to landing! During this short return flight, I went into minor shock and couldn't stop shaking until I was inside the Medical centre. The 2 boys were assessed fit and well as we had expected, just somewhat shook up. As for me, I was a little battered but OK. I was later taken to Bangor Hospital for a precautionary head X-Ray. All was fine I'm pleased to say. They did find an undamaged brain in there! Needless to say, we were all lucky to have survived that and I was particularly lucky not to have been hit in the face by the bird. It would have taken my head off and into the back seats! The birds' beak left a long scratch down the right side of my flying helmet as it passed by! It was THAT close. 'Bunny' was also very lucky not to have had the same thing happen to him! We did have quite a few beers later that night to celebrate being let off by 'Mr Grim Reaper Esq.' and toasted 'Lady Luck'; the next day was debrief, paperwork and another medical check. By now I had a super black eye and slightly bruised ribs, not to mention a 'neat duelling scar' in my left eyebrow. On 4th Sep, only 2 days later, 'McHoot' and I went off and flew that mountain flying training sortie together in Gazelle ZB628 just to tidy things up and lay any ghosts to rest. Infact, whilst flying out of RAF Valley on our way home, we flew over and looked down on ZB627 still sitting in a field awaiting road recovery! We had a super training trip and enjoyed each others company more than before. 'McHoot' handled the Gazelle extremely well for his level of experience and I wrote him up for an RAF Green Endorsement award, which he subsequently got. His skill saved 'Bunny's' and my life! 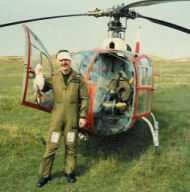 'McHoot' and 'Bunny' went on to have long careers in the RAF helicopter world and I resumed instructing on Gazelles, barring a few operational detachments and other duties until August 1993. My greatest moment in aviation was undoubtedly the day Air Commodore Tetley, RAF pinned RAF pilots wings on my chest at my flying training course graduation ceremony at RAF Shawbury. I had dreamed of becoming an RAF pilot since I was 4 years old. I made that decision and never looked back! Many, many times as I was growing up people said what if you don't make it? well, I did make it !!!! I owe a multitude of people sincere thanks for their support, advice and guidance throughout my early years of aspiration. Like all these things, the list is exhaustive but I would like to mention the key players here. Flight Lieutenant Tommy Culham, RAFVR(T). My Air cadet squadron commander who encouraged me all the way and helped me attain life changing experiences. Joining 2223 (Ulverton) Squadron, ATC was one of the best things I ever did! Mr Les Fieldman, Air Cadet civilian instructor and man extraordinaire! Mr David Rimmer, School Geography master and careers advisor to whom I owe my eventual success in attaining the personal development and academic qualifications I needed to succeed. To all my 'mates' in the Air cadets who like me, fitted school around all the activities on offer and making the most of them. And finally but most importantly, my parents Bill and Margaret. Guiding lights throughout my entire life. 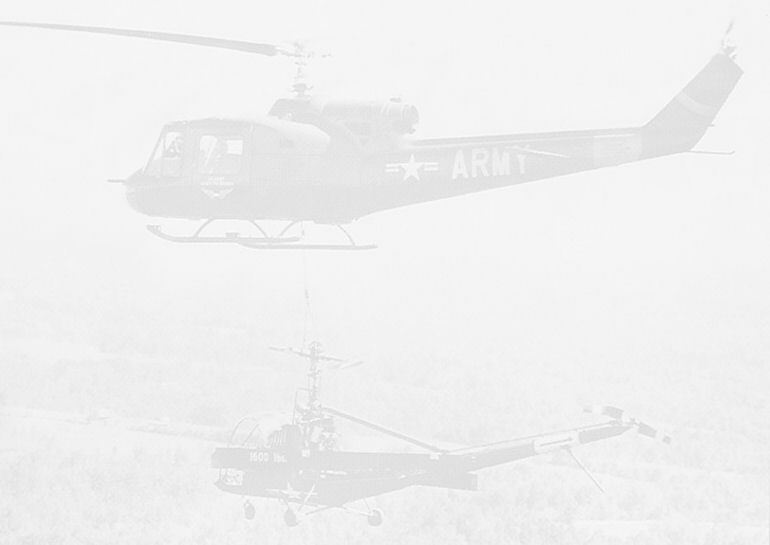 .just like Phil Connolly's long term dream of flying a HUEY!